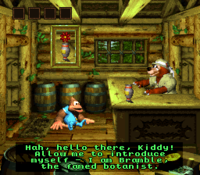 Bramble's Bungalow is Bramble's home in Donkey Kong Country 3: Dixie Kong's Double Trouble! It is located in the central part of the Northern Kremisphere, immediately northeast of Cotton-Top Cove. The bungalow is home to not only Bramble, but a caged Banana Bird that he's acquired somehow. However, he'll only give it to Dixie Kong and Kiddy Kong after they've helped him out. The Kongs can visit the bungalow once they gain access to the Hover Craft. In the Super Nintendo version of the game, Bramble is looking for a Flupperius Petallus Pongus, which grows only at the end of a path just to the east of his bungalow. However, pollution from the nearby island of Mekanos is killing off nearby plantlife. The Kongs must not only deal with the factories of the island, but wait until they've cleared Razor Ridge before another Flupperius Petallus Pongus will grow again. By collecting the flower and bringing it to Bramble, they will receive his Banana Bird. In the Game Boy Advance version of the game, Bramble gives away his Banana Bird for free any time after Mekanos is conquered. However, the Flupperius Petallus Pongus he wants is in possession of Bachelor. If given the Flupperius Petallus Pongus, Bramble gives the Kongs his Rose in exchange, which is an item that Bachelor wants. This page was last edited on September 5, 2018, at 02:03.